Your GE 30 in. 5.6 cu. 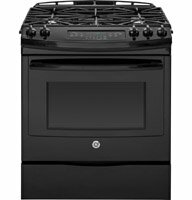 ft. Slide-in Gas Range in Black has Convection Bake and Convection Roast, plus a Self-Cleaning oven. The Precise Simmer burner allows cooking of delicate foods with low, even heat. The 17,000-BTU Power Boil burner delivers intense heat for fast boiling. 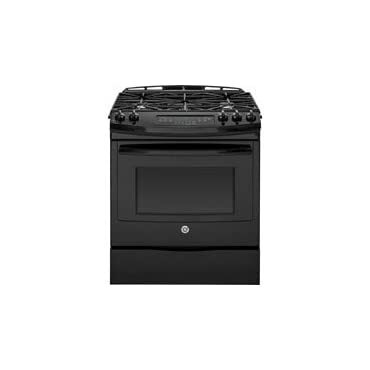 The black gloss oven interior lets you enjoy a clean and sleek appearance. GE appliances provide up-to-date technology and exceptional quality to simplify the way you live. With a timeless appearance, this family of appliances is ideal for your family. And, coming from one of the most trusted names in America, you know that this entire selection of appliances is as advanced as it is practical. Color: Black. Last updated: April 18, 2019 at 11:37 EST. Pricing information is provided by the listed merchants. GoSale.com is not responsible for the accuracy of pricing information, product information or the images provided. Product prices and availability is subject to change. Any price and availability information displayed on amazon.com or other merchants at the time of purchase will apply to the purchase of the product. As always, be sure to visit the merchant's site to review and verify product information, price, and shipping costs. GoSale.com is not responsible for the content and opinions contained in customer submitted reviews.